The Samsung Galaxy S III is the handset every cool kid wants these days - it’s probably the most powerful Android device there is currently plus it’s offered on all US carriers starting from today. 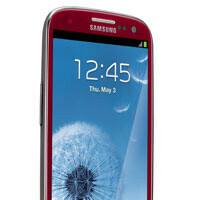 But while you might be tempted to rush to the store and get the marble white or pebble blue one, wait a sec before you do that as we get to know that AT&T will sport a gorgeous, classy garnet red Samsung Galaxy S III. Yes, AT&T is lucky enough to get its exclusive own color of the Galaxy S III and if red is your thing waiting three days wouldn’t hurt too much now, would it? That’s when pre-orders for the red Galaxy S III start - on July 15th. It will be in stores exactly two weeks later on July 29th. Now is this another color that Samsung will claim it invented? (It claimed so for the blue one!) We don’t know, but what we do know is that with the red Galaxy S III you’re not missing any of the fun - it sports the same gigantic 2 gigs of RAM and 16GB of internal storage, expandable via a microSD card. Looks cool and not girly IMO. Wish VZ offered this color and I would gladly take my Pebble Blue one back. WHY?! PEBBLE BLUE IS UST AS GEORGOUS AS GARNET RED, IN MY OPINION. Samsung's phones look like chinese knock offs there is something about their phones that is just not catchy. I thought the same until I actually held the device in my own hands. It feels solid in the hands and it definitely does not feel cheap. Trust me, the pics don't do the phone justice. Its nice and well built. i agree. the reviews and photos in the internet look crappy but when I held one... it's like touching divine material. lol. solid and great ergonomics. i have to disagree. i've held both the blue and white s3. the glossy finish looks really cheap. my one x still holds the best design for a phone in my opinion. well, maybe because i just dig the matte finish. but of course, specs-wise, s3 is the better one. We never said it's better in terms of build quality than One X, what we are saying is that it is better in person, unless you are really very conservative when it comes to materials used on a phone.. I think the One X and the S3 are pretty close to equal. I don't really get a "cheap" vibe or the S3 in blue, though I do prefer a matte texture. Unfortunately, we Verizon customers don't have the option of the One X.
tes101 is just a troll. Don't mind him. apologies for stating my opinion. You're right, it feels so solid but then the hyperglaze makes it so slippery to hold, it already jumped out of my hand.. its a good thing i was able to catch it.. funny but true. Knocks offs of what exactly? Phones are starting to run out of ideas when it comes to designs. It's a battle of the bezel right now the GS3 looks great, but side rocker button placement are a problem. this red one looks so unique. but imo, it's not good looking. the blue one was awesome. this... not so much. Red goes along with black most of the time... not all plain like this. I agree. I would definitely have chosen this one out of the other colors if I had the choice at the time of my purchase. Looks like a black S3 could be possible. If they can go with red and blue, then why not pure metal black. It would look awesome! I want the white, when will that be available? I just got a galaxy s III the other day, and had to get it blue cuz they hadn't gotten any white ones in. Omg.. October needs to hurry up and get here.. I want my GS3!! I don't like red phones in general but variety is always good. Although, it does seem odd that a black option doesn't exist. Obsidian Black! Or maybe something with a subtle brushed metal texture like Pebble Blue has.